Poverty is an economic classification that refers to a condition where basic resources are lacking or where minimal levels of income are considered acceptable in a given society. High poverty rates are often associated with high levels of unemployment, and can indicate the extent to which a community is economically distressed, i.e., unable to meet basic needs. 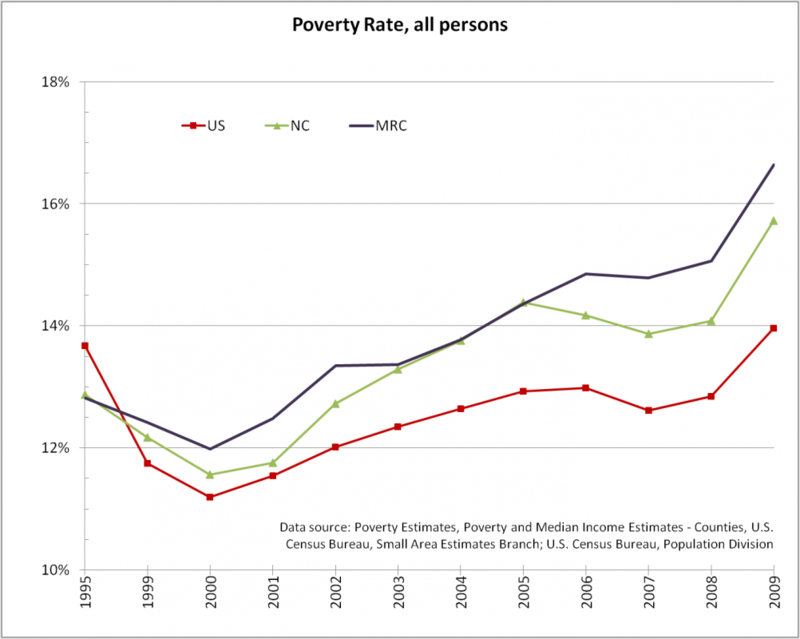 In 2009, an estimated 16.6 percent of people (all ages) in the Mountain Resources Commission (MRC) region were in poverty, compared with 15.7 percent in North Carolina and 14 percent in the U.S. While the MRC region has experienced poverty rates higher than the state or national level for the past decade, this has not always been the case. In 1995, for instance, the poverty rate in the MRC region was 12.8 percent, lower than the state level of 12.9 percent and the national level of 13.7 percent. The MRC region’s fastest-growing county – Henderson County – had the lowest poverty rate in the region, at only 12.2 percent in 2009. Rutherford County, with the highest unemployment rate, also had the highest poverty rate, with 21.3 percent. The poverty rates for children (under age 18) in the MRC region are higher than those for the general population. In 2011, an estimated 28.5 percent of children in the MRC region were in poverty, higher than both the state (25.4 percent) and national (22.5 percent) rates. The disparity between the general population poverty rate and the child poverty rate follows national trends and is attributed to the fact that poorer families generally have more children per adult than the population as a whole. 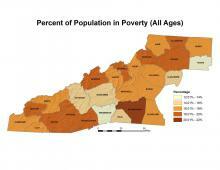 For the region, Henderson County had the region’s lowest child poverty rate, at 22.8 percent in 2011. 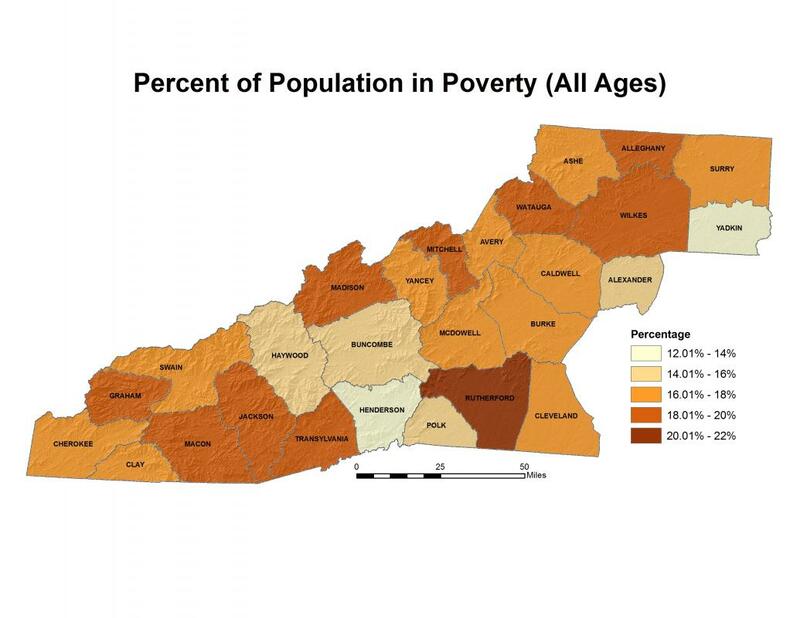 However, Rutherford County – which had the highest general population poverty rate – had a child poverty rate of 32 percent in 2011, which is lower than six other counties in the MRC region: Alleghany (32.7 percent), Clay (37.7 percent), Graham (35.4 percent), Haywood (32.4 percent), McDowell (33.5 percent), and Wilkes (35.1 percent). Another statistic closely related to poverty rates is the percentage of households receiving benefits through the federal Supplemental Nutrition Assistance Program (or SNAP, formerly known as the Food Stamp Program). 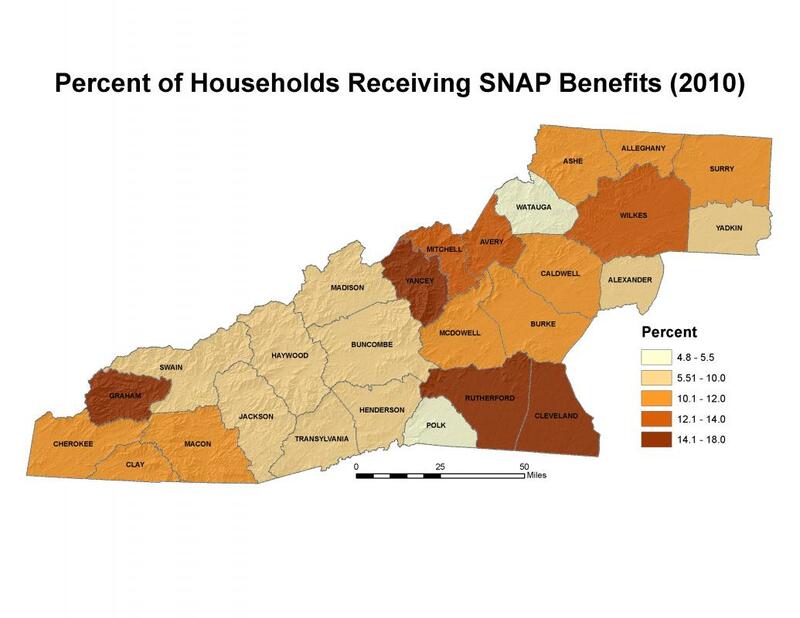 In the MRC region, Yancey and Rutherford Counties have the highest percentage rates of households receiving SNAP benefits (17.1 and 15 percent, respectively). 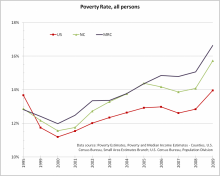 Poverty rates among the national, state, and regional levels show significant and steady increases since 2008, with the MRC region having nearly three percent more of its citizens living in poverty than the national average. U.S. Department of Commerce, United States Census Bureau. Small Area Income and Poverty Estimates. Accessed from: http://www.census.gov/did/www/saipe/.